The heartless killing of 34 striking miners at Marikana on 16 August 2012 by the South African police startled the world both in the manner and period it happened. 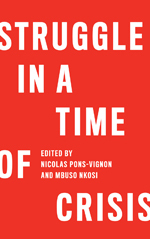 Almost 20 years after the demise of apartheid, it evoked memories of the past and raised questions about the post-apartheid socioeconomic and political order and the integrity of industrial relations. This paper argues that Marikana is a crisis linked to the intersection of precariousness and fragmentation of workers. In explaining the choices by different stakeholders, it is imperative to unpack the political, historical, social and economic context. The Marikana tragedy was, in fact, the zenith of a strike wave that had kicked off in January 2012 at Impala platinum mine following action by disgruntled rock drill operators (RDOs) after being excluded from a retention allowance awarded to mine blasters. This later spread beyond the platinum sector and was characterised by similar claims, violence and repertoires. The workers set uncompromising demands such as R12 500 per month for RDOs through independent workers’ committees directly to management disregarding industrial relations structures. Their militancy was unprecedented and from the onset rejected by the majority union, the National Union of Mineworkers (NUM). In industrial relations theory, conflict is managed through institutionalisation which assigns a key role to the development of institutions to regulate and manage conflict. Apartheid strike violence was explained by inadequate institutionalisation of industrial relations for black people. The struggle for democracy then undermined institutionalisation as blacks gained partial recognition as workers without political citizenship. Democracy has been associated with the broadening of political participation, as well as balancing political rights and promoting nonviolence in claims. It has also brought about the establishment of third parties, for example, conciliation and arbitration panels to prevent violent resolution of disputes. Violent outbursts often bring to the fore simmering social tensions which in Marxist theory are associated with transformation. Can the Marikana tragedy be viewed from a similar perspective? Post-apartheid legislation guarantees both industrial and political citizenship. However, institutionalisation of industrial conflict is undermined in the context of unresolved broader socioeconomic tensions. Before democracy, the majority of the mine workers lived in hostels as a solution to housing problems and a way to control the black workers. This system was designed to externalise costs and maximise profits. The black workers had to live here alone and were paid as single employees on the premise that their families had access to land for subsistence farming. Control of these hostels was a means of ensuring worker control through ‘compounding of labour’ (Bezuidenhout and Buhlungu, 2010). The NUM was however able to subvert employers’ logic of control by turning hostels into sites of mobilisation after 1982. As part of a strategy to destroy the apartheid legacy and its symbols and restore the dignity of blacks, the new African National Congress (ANC) government and Congress of South African Trade Unions (Cosatu) resolved to gradually get rid of the hostels and promote the construction of decent family accommodation. However, what emerged does not reflect this vision. While these hostels still exist, many mineworkers now live in informal settlements, villages, low-cost government housing or have bought their own homes. Unions negotiated for employers to convert their obligation to provide housing into a “living out allowance”, rather than the hostels being the only option. The majority seem to prefer this to supplement their income. At Impala platinum mine, only 5000 of the 33000 direct employees remain in hostels. Lonmin only provides the recommended accommodation to 2342 of its 28 000 direct workforce. At least 50% of the population in communities living within a 15 kilometre radius of its operations live in informal settlements that lack access to basic services (Lonmin, 2011; Interview 5, 2012). This new geography is tied to new contours of class fragmentation on the basis of settlement, skill, gender, contract of employment, and so on. The focus has shifted from hostels to informal settlements which sprang up with the platinum boom. There are at least 38 of them around Rustenburg, characterised by people of the same ethnic group living in the same settlement. Nkanin is dominated by Xhosa and Sotho migrants who illegally settled without sanctioning by local Tswana traditional leaders. This new spatial geography has a bearing on labour relations. Local state structures, in some informal settlements, are absent and substituted by informal structures that use vigilante type violence to maintain order. Many are ‘no go areas’ for the police and other ethnic groups. This creates an alternative context for ‘local moral order’ to emerge. Many workers are from the Eastern Cape (a South African province), Lesotho, Mozambique and Swaziland and have two families – one at their place of origin and one where they live and work. Fragmentation of workers may also result from the nature of the contract. In line with the neoliberal dispensation, mining capital has drifted from compounded to fragmented labour (Bezuidenhout and Buhlungu 2010). In the past, the majority of mineworkers were directly engaged by a single employer. However, a significant proportion is now hired through third parties. Lonmin employs 28000 workers directly and close to 10000 through third parties; Angloplats 54000 and 8000; and Impala 32 900 and 13 700 respectively. Aquarius, with a different business model had 1725 direct and 10 141 indirect employees in 2012 (Angloplats, 2011; Impala, 2011; Lonmin, 2011; Aquarius, 2012). The changing nature of employment is driven by global economic changes and shaped by the dominant ideology designed to maximise returns and minimise risks. The platinum boom was accompanied by a proliferation of triangular employment characterised by variation in conditions of employment and compromised workers’ collective solidarity. During apartheid there was an intersection between race and skill. Blacks were confined to unskilled jobs. As a result, the workers’ struggles were usually forged around race. This changed after the democratic transition, as black skills were broadened. The Marikana tragedy may be partly explained by institutional failure linked to social distance. This occurred when the leadership of the union become “progressively lethargic to conditions of the poor (Cosatu, 2009). Michels (1911) argues that as organisations grow, leaders develop values at odds with membership. They become less concerned with the ideology of the group and more obsessed with staying in power. Similar challenges afflicted unions at Marikana. In the strikes, many workers deplored the NUM’s poor service, rampant corruption and indifference. Social distance reflects that union leaders are not in the same class terms as membership. This threatens union hegemony. The unions are conscious of such challenges. Cosatu general secretary Zwelinzima Vavi lamented the problems of growing social distance at the federation’s 11th congress, drawing from his own personal experience. As a steward in the 1980s he lived with the majority of the workers and was intimately part of their daily struggles. However, when he moved up the ladder he shifted from a high density to an affluent suburb. He bemoaned that this disconnected him from reality and is a common challenge facing unions (Vavi, 2012). Vavi’s experience is similar with the NUM Marikana branch committee members who do not live in Nkanin where the majority of workers reside without roads, running water and electricity. The union branch committee is responsible for the allocation of company accommodation, thus it has easier access. Interviewed workers indicated that no NUM branch committee members reside there except a few stewards. This contrasts with apartheid struggles when union activists were intimately tied to the lives of ordinary workers and citizens. Workers had genuine legitimate expectations of the post-apartheid order, that is, liberation from exploitation, social reconstruction and economic development and improvement in their general lives. However, this has not been realised for many who live in squalid conditions. Workers at Marikana were thus questioning their position in the new order. In industrial relations theory, the foundation of industrial relations is collective bargaining premised on mutual compromise. However, the post-apartheid order has reconfigured the relationship between some employers and undermined this. Workers may thus respond violently. The post-apartheid order is characterised by changes in the character of union leadership and transformation in class terms. Marikana was a rejection of this. This reflects that the post-apartheid order remains unsettled and contested. As a result, institutionalisation of industrial relations remains limited and precarious. Von Holdt (2010) argues that this is tied to the broader political and socioeconomic factors. Violence at Marikana was about the contestation of orders (workers versus capital in collaboration with the state and the union). The workers engaged violence to overcome fragmentation and challenge an order of inequality which characterises the new South Africa. In extreme cases, they set up underground committees for meting out violence. Police violence was about restoring state-capital order and an otherwise crumbling industrial relations order. Violence is thus a means of defending and contesting different orders. The Marikana tragedy highlights the problem of the intersection of worker fragmentation and precariousness. Similarly, as with the lack of political citizenship, it challenges the institutionalisation of industrial relations and undermines collective solidarity. In such contexts, as at Marikana, the institutions get overwhelmed and fail to manage industrial conflict and violence. Crispen Chinguno is an ICDD PhD fellow at the University of the Witwatersrand, Johannesburg. His project explores the dynamics of strike violence in post-apartheid South Africa by drawing case studies from the platinum mines before, during and after the Marikana massacre. He is an alumnus of GLU South Africa and has worked with trade unions in Zimbabwe, Botswana and South Africa. Cosatu, (2012). Response to ANC Discussion paper on Organisational renewal. Lonmin, (2011). Sustainable development report: Settling employee.